It's been a long time since I've shared a peek inside my home, hasn't it? But today I'm excited to invite you into one of my favorite spaces in this house: my new kitchen! 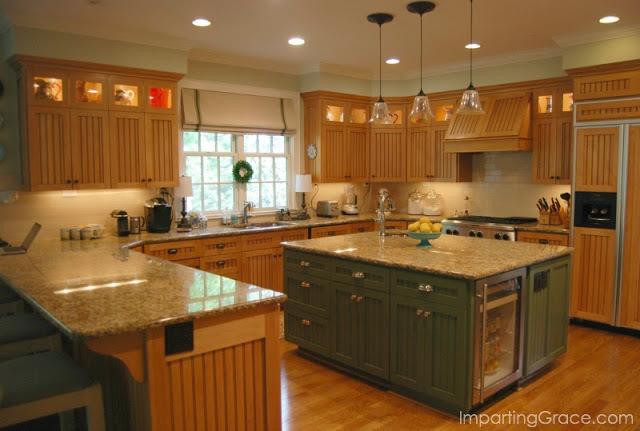 To give a feel for how much this kitchen has changed over the years, here's a look back. I knew that this damage had to be repaired, but it took me a long time to decide what to do. 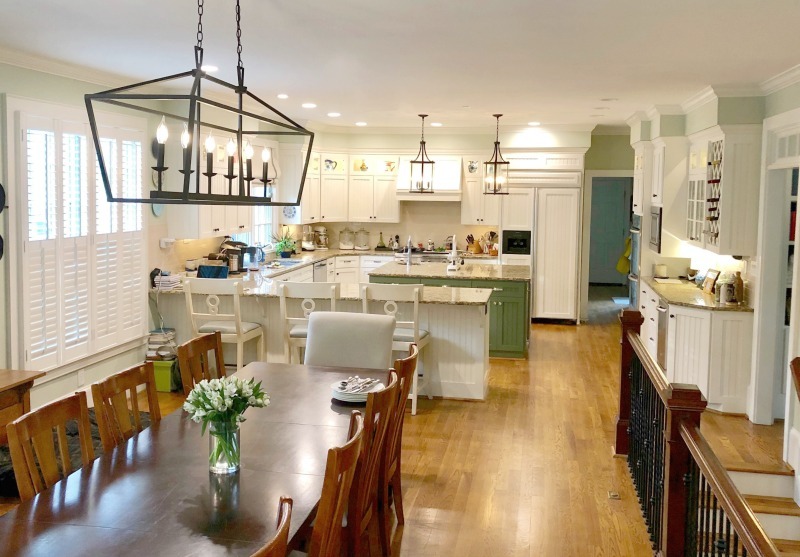 Finally I consulted two friends: one who has remodeled four kitchens for herself and one who is a top-notch local realtor. Both of them advised having the cabinets painted. To be honest, our granite countertops are not my favorite. 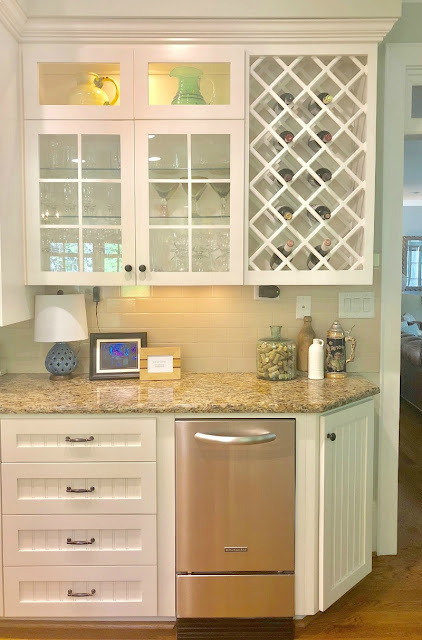 I love the sleek, clean look of marble or quartz. 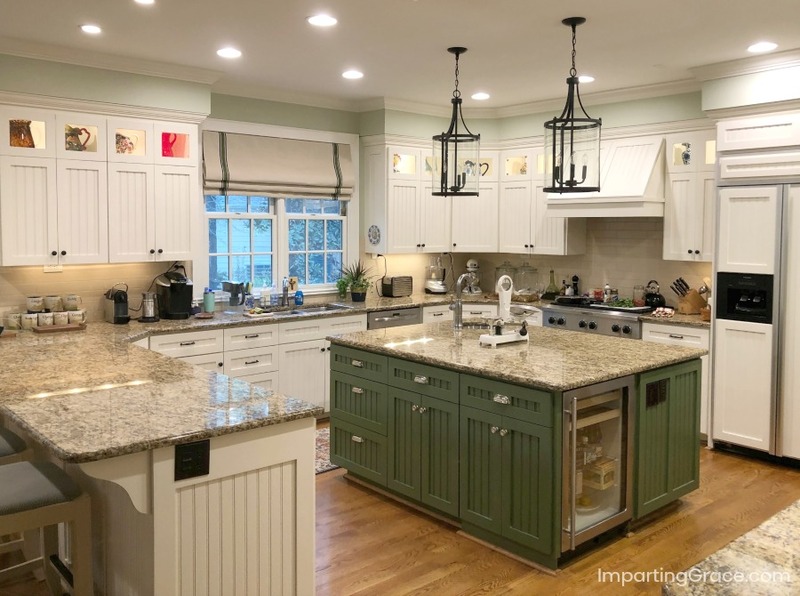 But the countertops are in great shape, and the same granite is still being used in kitchen construction. "Your granite is fine," pronounced my realtor friend. 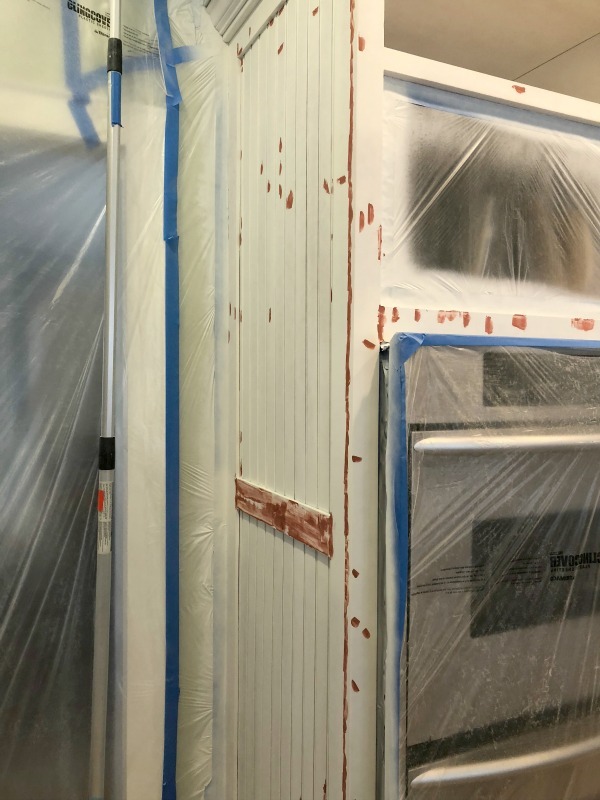 And my friend with kitchen remodeling experience suggested that I start with painting the cupboards and just see how I felt once that was done. 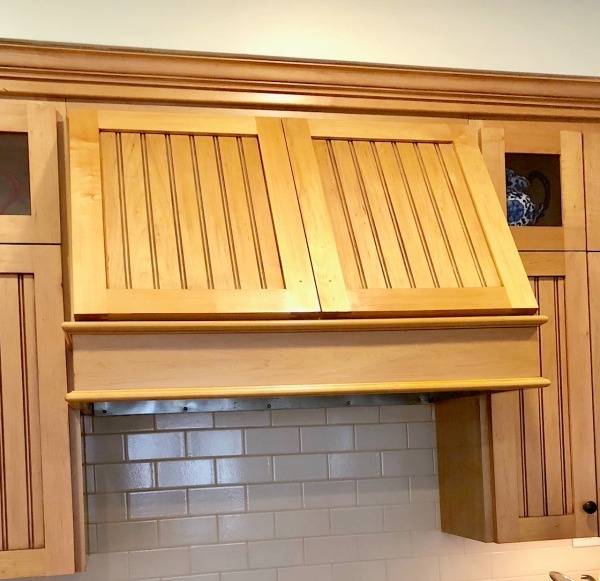 "You might find that the painted cabinets give you a whole new kitchen," she advised. She was right! Everything feels so much lighter and brighter now! 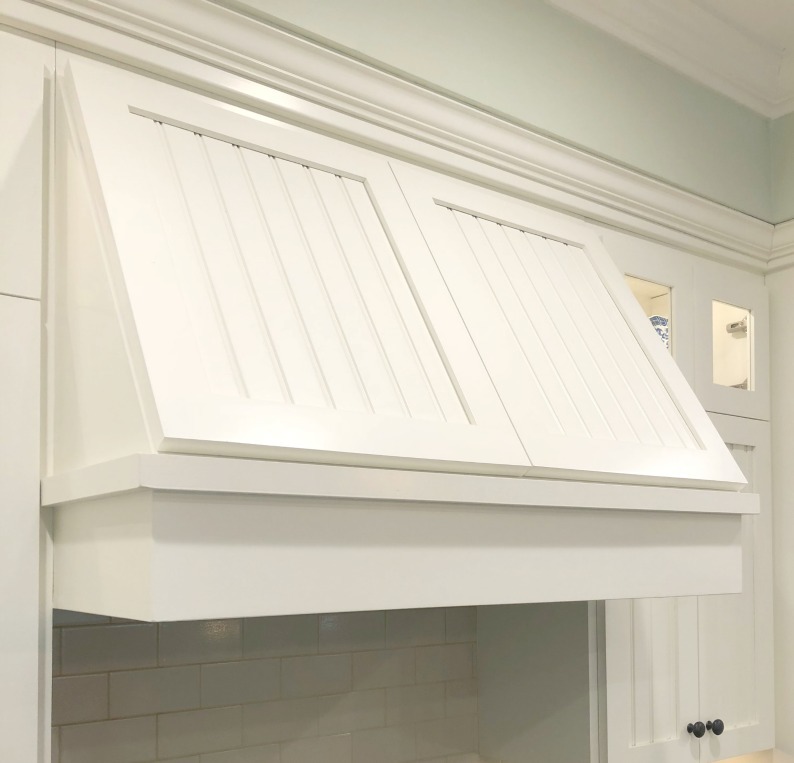 I considered replacing the range hood with a stainless steel one, but the cost was crazy expensive, in my opinion. 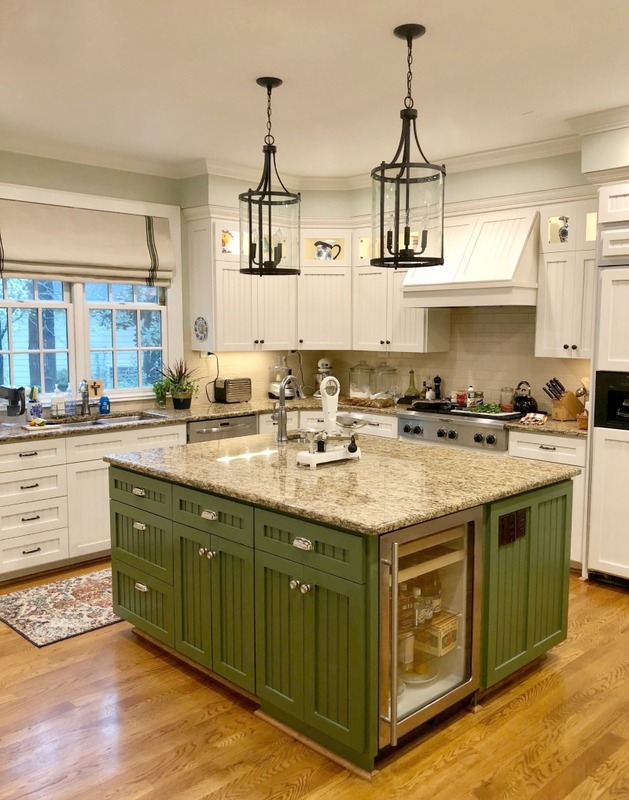 So I looked for inspiration online, and found at hood I liked at Home Stories A to Z (Beth's kitchen is simply gorgeous!). The other changes were smaller. 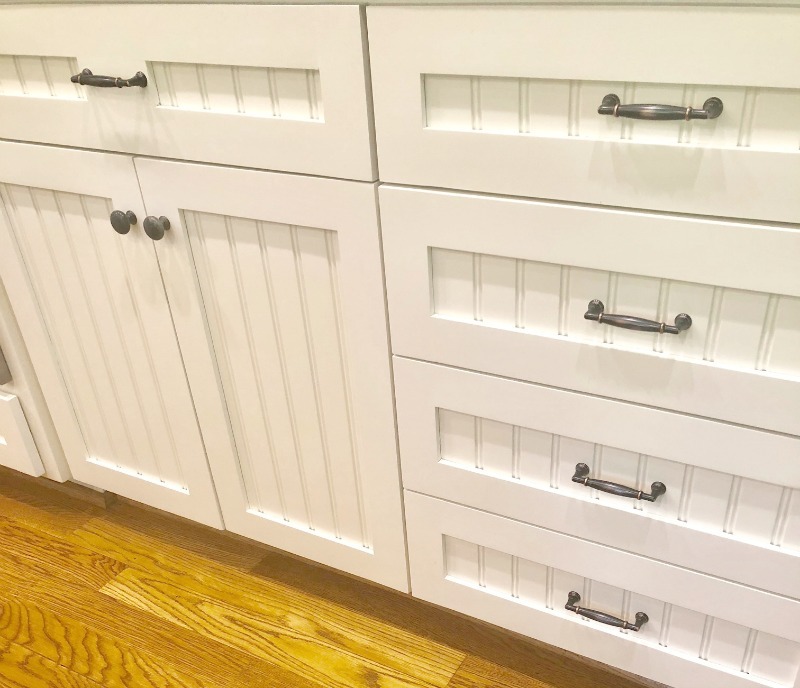 I swapped out the drawer pulls, but re-used the knobs, sticking with oil-rubbed bronze because it works well with the granite. 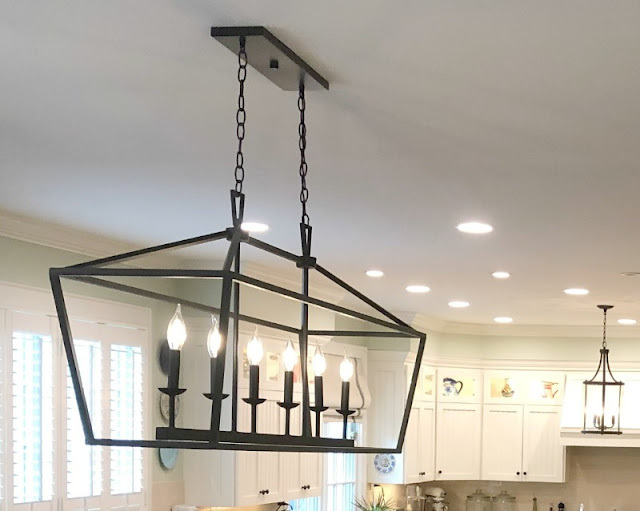 and added a small lamp to the serving area. I also wanted to add some blue to the window treatment. 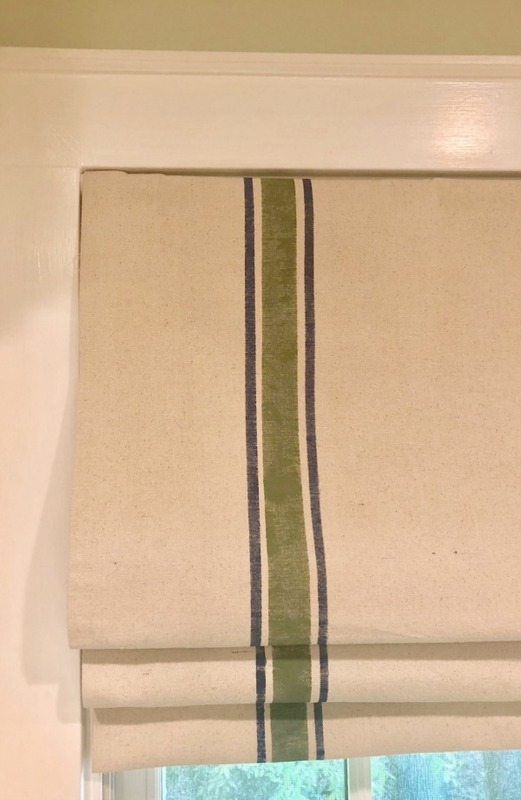 I still love my DIY Roman shade (full tutorial here), so I just painted over some of the green stripes with blue paint. Presto! 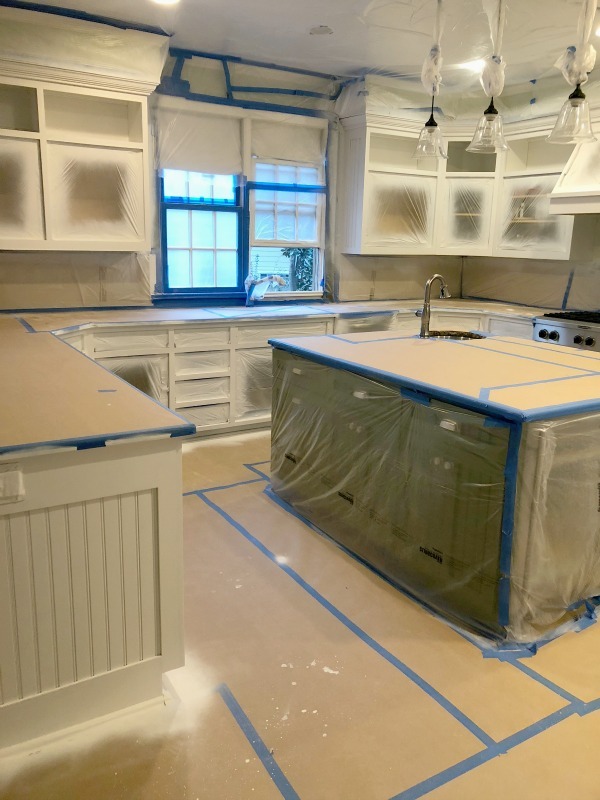 After removing all the cabinet doors and drawers to be taken to the shop, the painters taped off and tented the area. 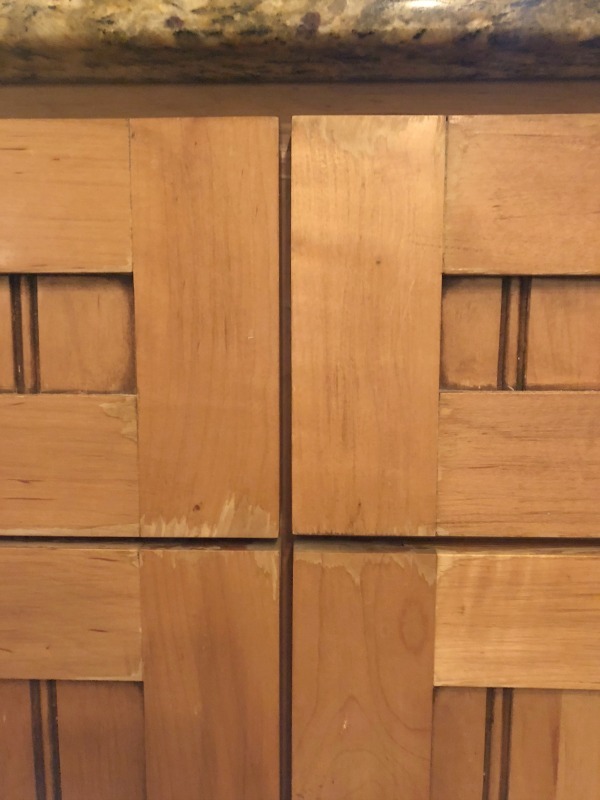 They removed the old finish, sprayed on a primer, then patched every visible imperfection. Then they sprayed on two coats of the white paint I chose ("Alabaster" from General Finishes). 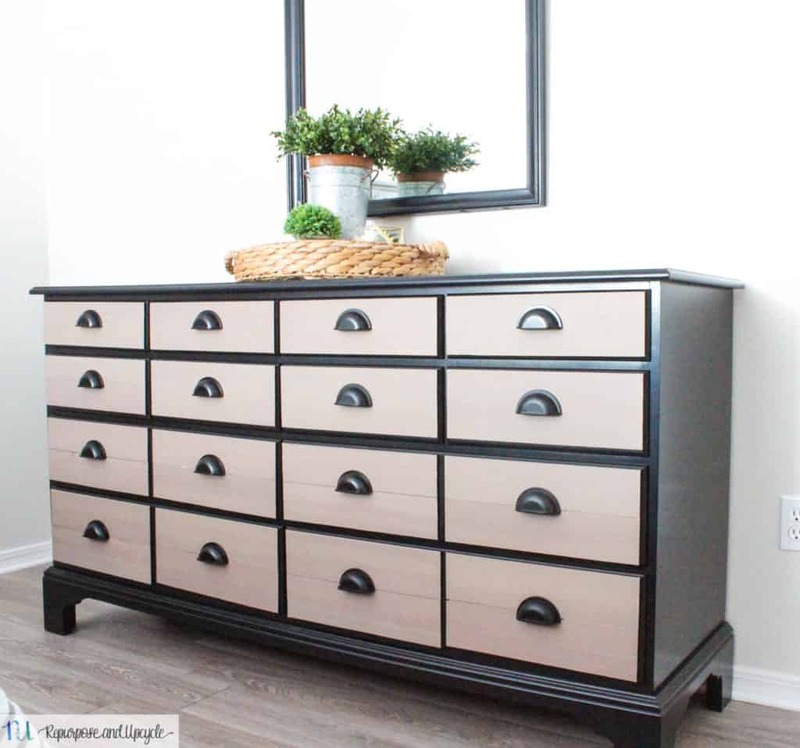 After seeing these guys work, I was filled with admiration for people who paint their cabinets themselves! All in all, I'm very pleased with our updated space. It's so clean, light, and bright. I'm glad I took my friends' advice. I do feel like I have a whole new kitchen! Hello, friends, and welcome! A blessed Holy Week to you! I'm glad you're here for this week's Grace at Home party, where we celebrate all the ways we make our homes places of grace. Here are some highlights from last week's party. 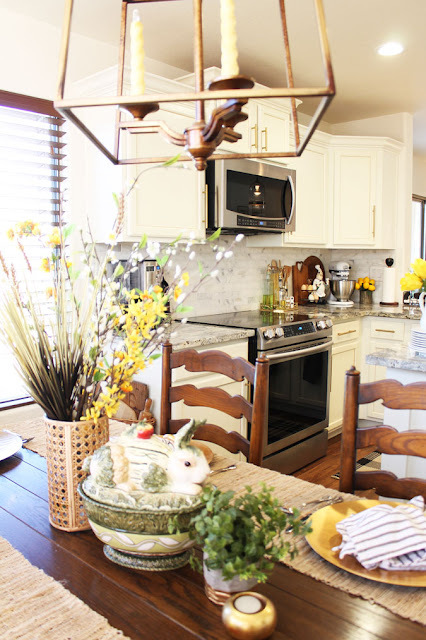 Since Easter is this Sunday, you might enjoy seeing the way Paula from Sweet Pea has decorated her home for Easter. 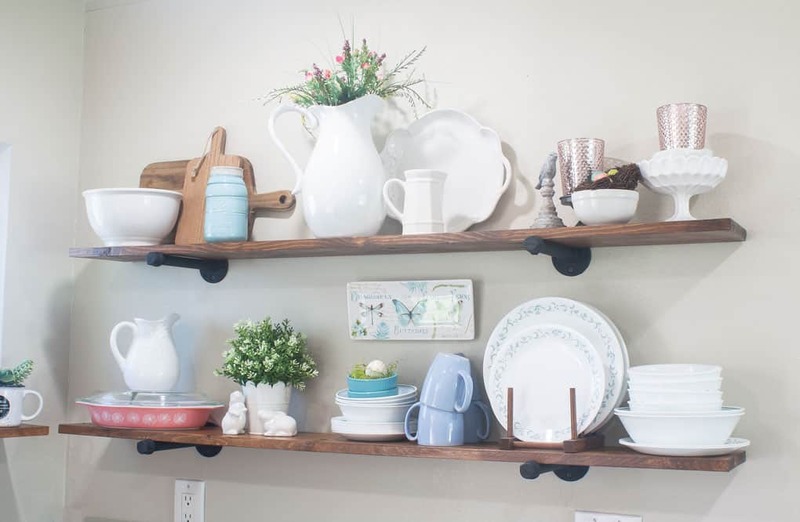 Paula has a treasure trove of vintage items, and the way she incorporates them into her decor is just lovely. 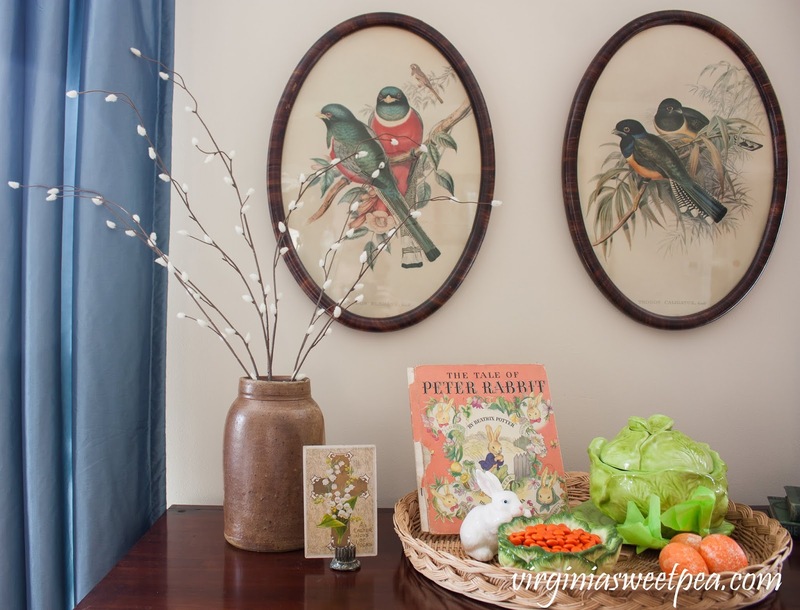 Springtime has lots of us energized for decorating our homes. 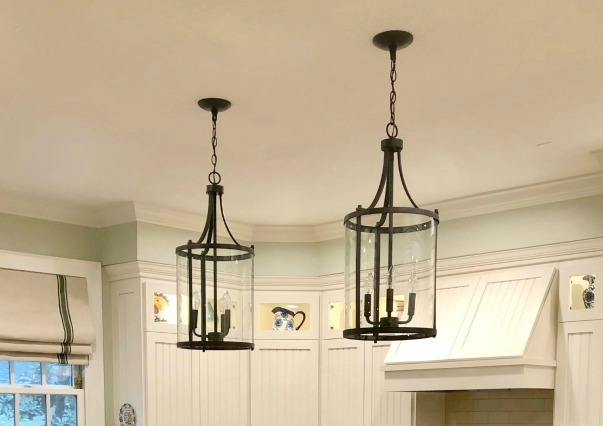 Decorative lanterns are popular but can be pricey, so I was glad that Lisa from Fresh Vintage shared step-by-step instructions for making a lantern out of picture frames. 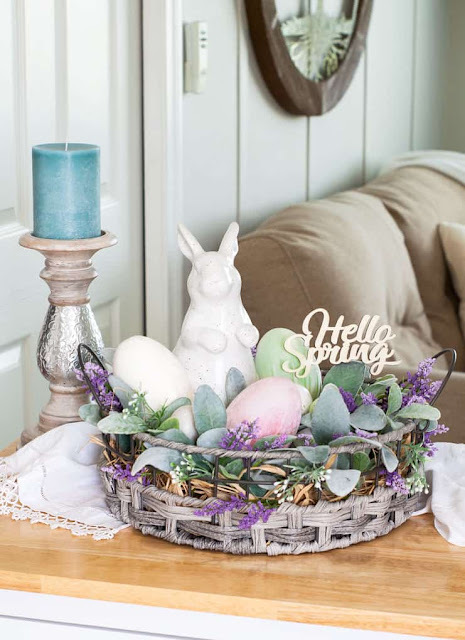 If you're still looking for items to fill Easter baskets, you might appreciate these non-candy ideas from Joy at Artful Homemaking. 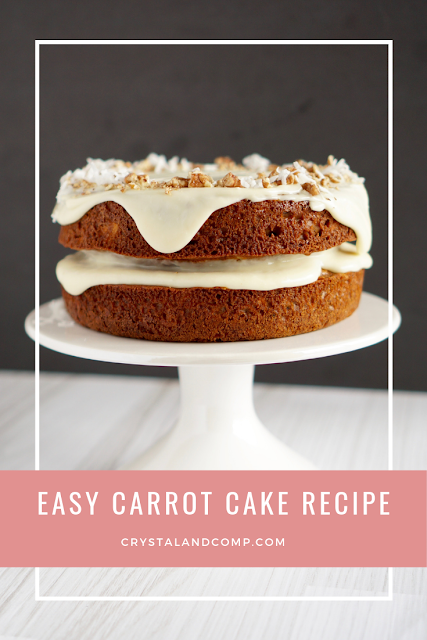 If you're searching for a wonderful dessert for Easter dinner, you might like this easy carrot cake recipe from Crystal at Crystal and Company. Crystal's instructions are thorough, taking all the guesswork out of this classic dessert. Holy Week brings thoughts of the sufferings of Jesus to our minds, but to be honest we struggle with the idea of suffering. 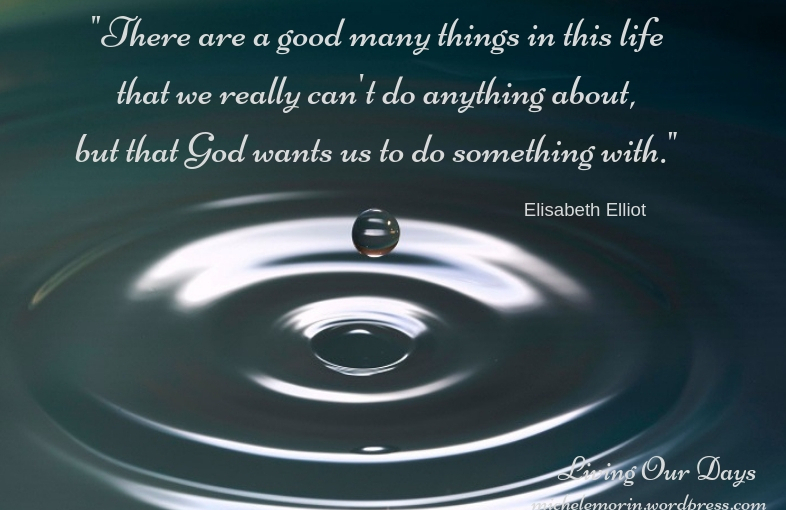 Michele Morin from Living Our Days offers some practical wisdom from Elisabeth Eliot about knowing God in the midst of pain. A big thank you to everyone who joined the last party! I'm so grateful for each person who links up. 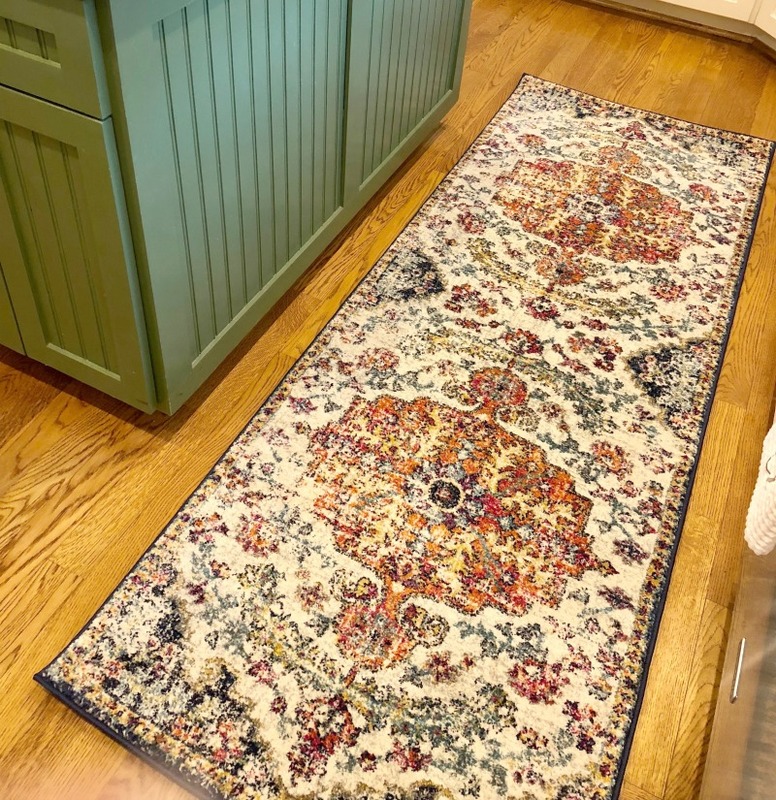 Whatever you do to make your home a place of grace, I'd like to hear about it. Here's what I ask of you. Please include the permalink to your post, not your blog's home page. Please let people know that you've linked up. No more than three posts per person, please. 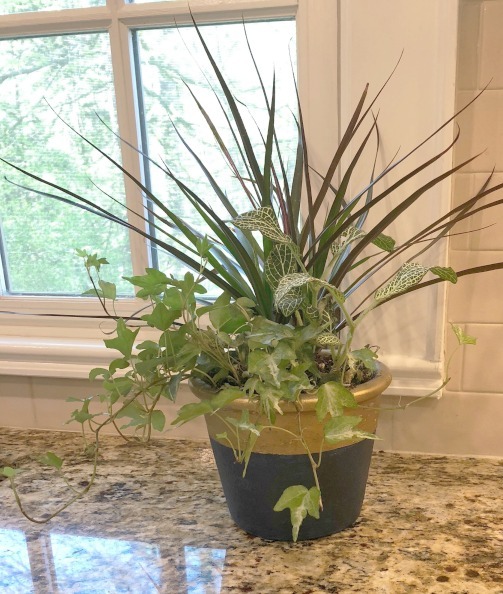 Note that if you link a post here, you are giving me permission to share your post, including a photo. And visit at least one of the other party participants--that's what really makes it a party! Hello, friends, and welcome to the Grace at Home party, where we celebrate all the ways we make our homes places of grace. 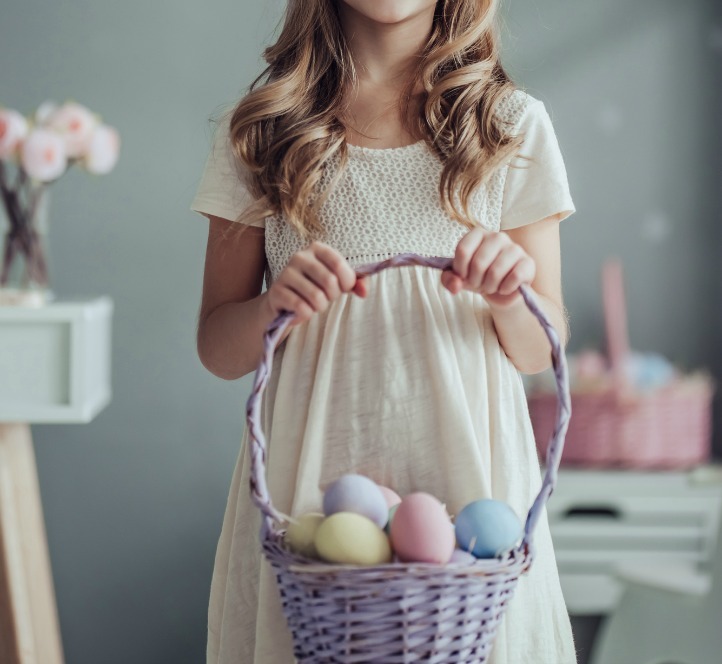 It's hard to believe that Easter is just a little more than a week away! Do you decorate your home for Easter? If you need some inspiration, you'll enjoy seeing the kitchen of Marty at A Stroll Thru Life. 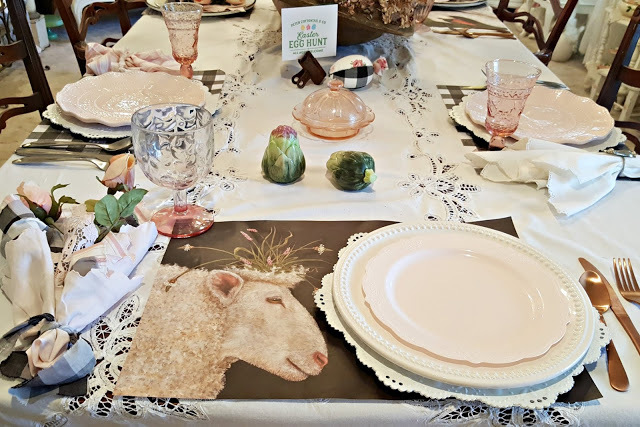 If you're thinking about setting a special table for Easter, you should check out this centerpiece created by Julie at My Wee Abode. Julie made those beautiful eggs, and she shares her method for making your own. 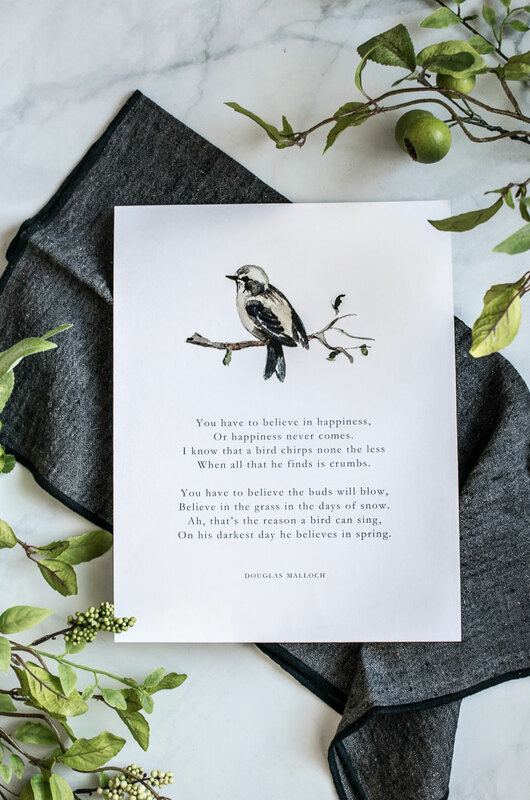 If you need a little extra something for your own spring decor, you'll be glad to see this free printable from Jamie at Anderson + Grant. Have you made your plans for Easter dinner? 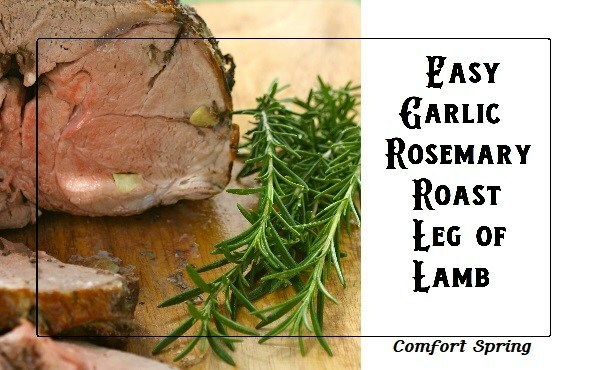 I've always wanted to try cooking a leg of lamb, so I was glad to see that Carol from Comfort Spring shared a recipe for Easy Garlic Rosemary Leg of Lamb. Doesn't that sound yummy? 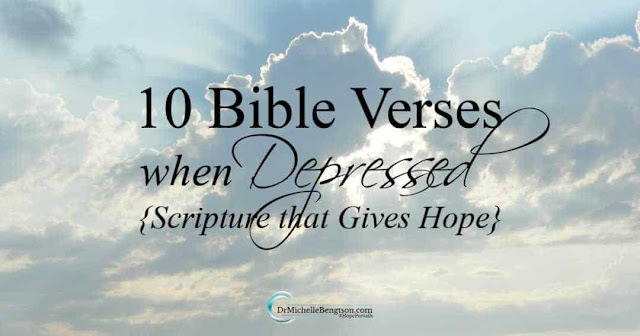 As beautiful as springtime is, there are still many who struggle with depression. 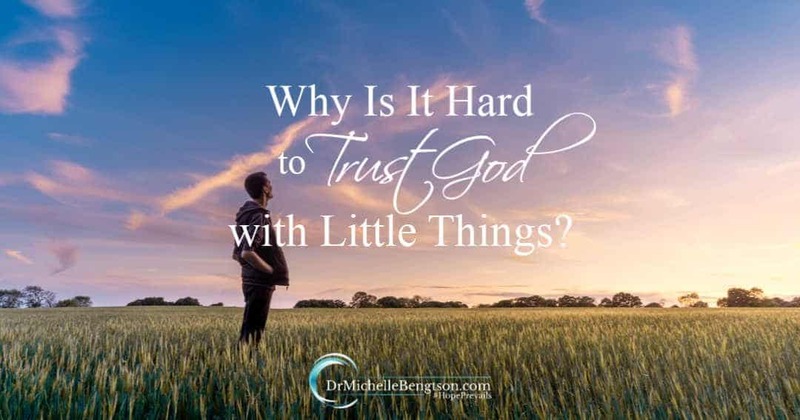 If that applies to you or someone you love, I think you'll be encouraged by this post from Dr. Michelle Bengtson. As for me, I was thrilled to share the cover of my forthcoming book. 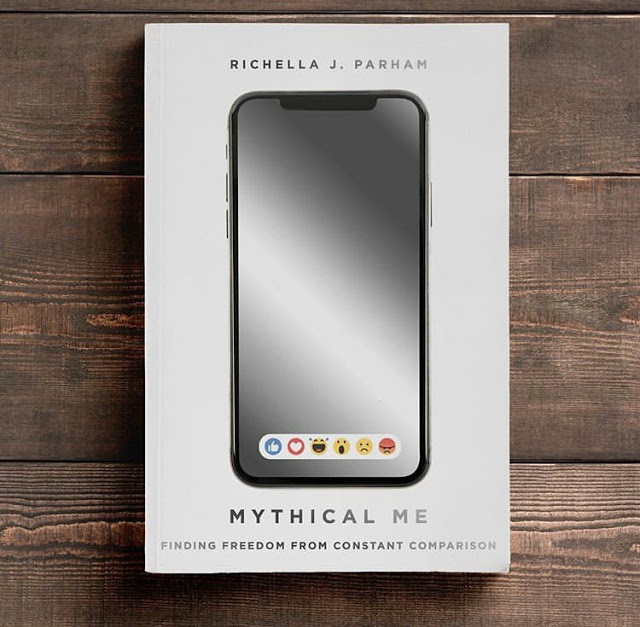 Mythical Me: Finding Freedom from Constant Comparison from InterVarsity Press will be available in October. I have some news to share with y'all. If you follow me on Instagram or Facebook, you may have already seen this. It's the cover art for my upcoming book! You may know that I signed a contract with InterVarsity Press on January 1, 2018. I turned in the first draft of the manuscript on August 1 of last year. Now, finally, all the writing and editing is done. Y'all, writing a book is a long, long, LONG process. Some parts of it are rich and rewarding; other parts are frustrating. But working with the art department at InterVarsity Press has been a dream come true. They asked me lots of questions about what I liked, then they considered the message of the book to come up with what I believe is a wonderful cover. Mythical Me: Finding Freedom from Constant Comparison will be available in October 2019. I am over the moon about this, but of course my book isn't for me: it's for you! What do you think? I'd love to know! Hello! Welcome, and don't blink--it's the end of March already! My goodness, 2019 is going fast, isn't it? I'm so glad you're here for this week's Grace at Home party, where we celebrate all the ways we make our homes places of grace. Here are some links from last week's party I think you'll enjoy. 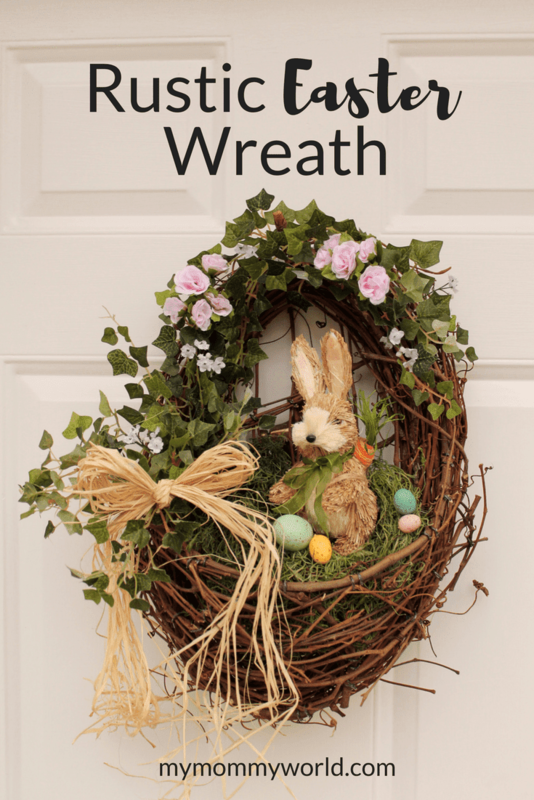 If you're decorating your home for Easter, you'll want to see how Erin at My Mommy World created an adorable wreath for the front door. Isn't this so cute? I am always looking for new main dish recipes so that I don't keep cooking the same old thing every night. 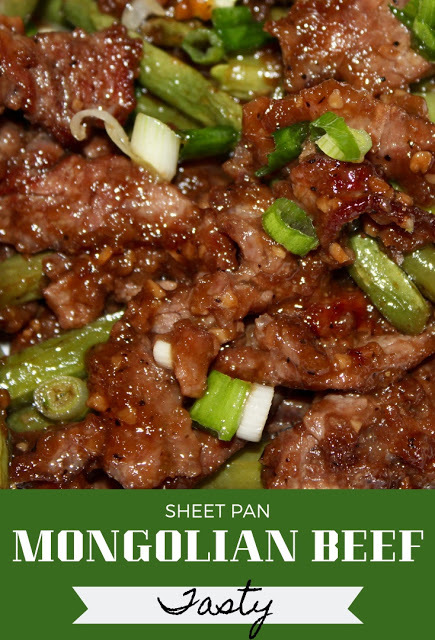 I was so glad to get this recipe for Mongolian beef made in a sheet pan! You can find it here from Andrea at Living on Cloud Nine. If you need some encouragement about trusting God with everything--including the little things--you'll be so glad to read this post from Dr. Michelle Bengtson. Hello, friends! 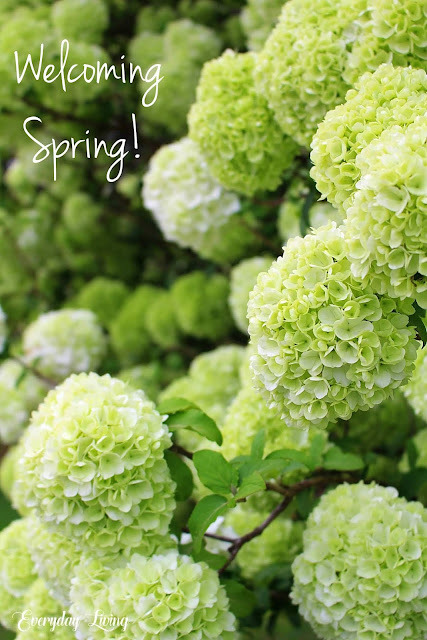 I hope this finds you doing well this first day of Spring!! I can hardly believe how quickly the days are flying by. But I must say I'm happy to see the end of winter. Here in North Carolina, the flowering trees are all in bloom. How are things in your neck of the woods? I'm so glad you're here for the Grace at Home party, where we celebrate all the ways we make our homes places of grace. Here are some noteworthy links from the last party. Lindsey from Repurpose and Upcycle created this gorgeous dresser, and she shares her technique with us. 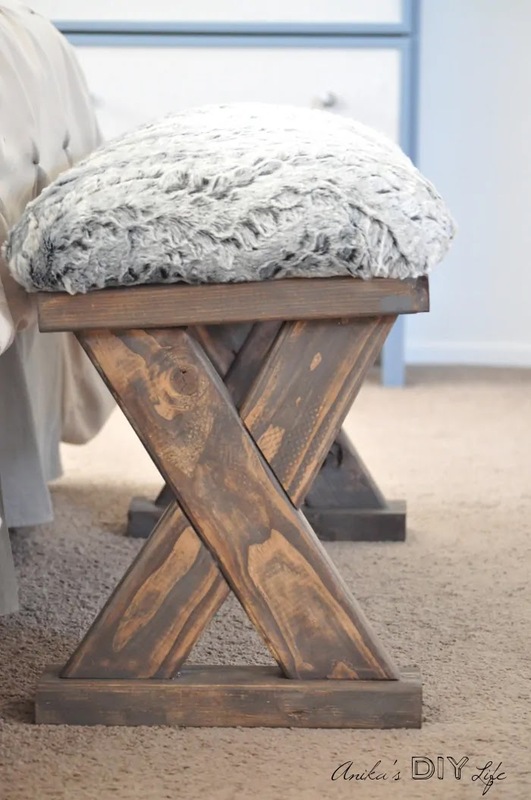 Anika from Anika's DIY Life built this ottoman from 2x4's. 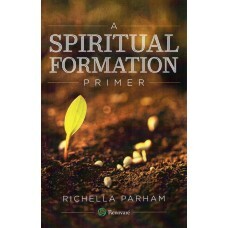 She shares complete plans and instructions for you to build your own. 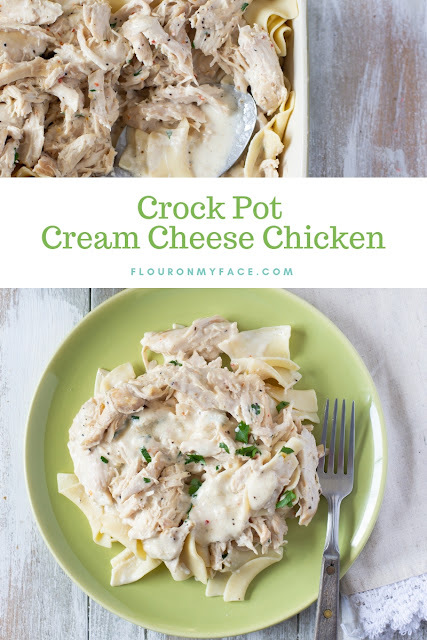 Arlene from Flour on My Face shares a recipe for Crock Pot Cream Cheese Chicken that looks truly delicious. I want to try this! 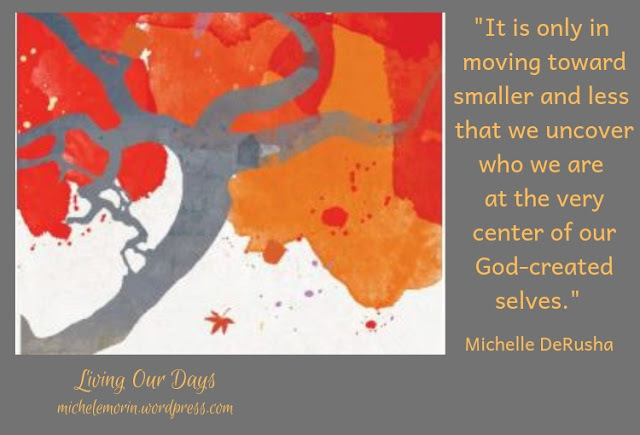 Michele Morin at Living Our Days reviewed Michele DeRusha's wonderful new book, True You. 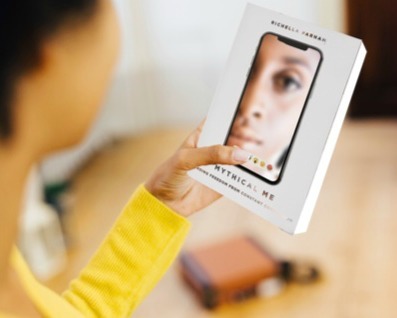 I think you'll want to read this review and also read True You!